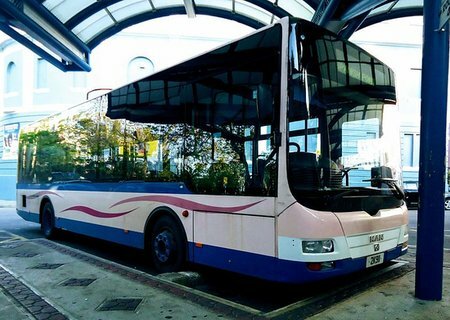 Bermuda's public buses (known as Bermuda Breeze Bus) are all pink in color. The color is inspired from the pink sands of the beaches that the island boasts of. The bus service provides a convenient, comfortable and efficient mode of public transportation within the island. The service network is so extensive that you can reach out to almost all corners of the island by bus. All buses are air-conditioned. The bus service is very popular to both locals and visitors. All bus routes (except one) operate between Hamilton City and other destinations in the island. If you are travelling from one end to the other (e.g. west to east), you need to take a transfer at Hamilton. Bus routes are divided into 14 zones of about 2 miles each. The bus fare depends on how many zones you are traveling. There are two types of fares in buses, one for up to 3 zones and the other for more than 3 zones (also called 14-zone fare). Transportation Passes, Tokens, or Tickets are the most common form of tendering bus fares. For paying bus fares in cash, you will need to tender exact fare in change. Dollar notes or bills are not accepted. The transportation pass is convenient and economical option of getting around the island if you plan to use buses & ferries several times a day. It gives unlimited hop on and off access to public buses as well as in ferries. However, for only one-time point to point travel between one place to the other, cash or token would be cheaper. You can also buy a pack of 15 tickets which can be used for 15 one way rides. There are several places like the Visitors Information Centers, post offices, bus/ferry terminals etc where you get the Passes, Tickets, Tokens etc. Visit Passes, Tickets, Tokens & Fares for complete info. There are 11 bus routes in Bermuda. All buses start from the central bus terminal at Hamilton City, reach out to various destinations within the island and return. The only exception is route #6 which starts from St George's town, caters to St Davids and returns. The Hamilton Bus Terminal is located on Washington Street, next to the City Hall. Check out Bermuda Bus Routes & Destinations to know about all the bus routes in Bermuda, destinations served by each route, time to destinations and more. Update August 2014: The Hamilton Bus terminal now displays the bus schedules and routes on the wall. Bus zones are the different sections of bus routes and approximately 2 miles each. But unfortunately there is no clear guide at the bus stops to know the bus zone number for the stop. Unless you know how many bus zones you are travelling between two places, you won't know the correct fare to tender with tokens, tickets or change. The fare up to 3-zone ride is lower than more than 3-zone fare (known as all-zone or 14-zone fare). Unfortunately there are so many routes, destinations and zones, tourists often get baffled trying to figure out number of fare zones between two points. Here is a quick guide to overcome that problem: Bermuda Bus Zones Demystified. Bermuda bus stops have poles that are either blue or pink in color. While you might find small concrete hut like structures at some bus stops which are the waiting areas for passengers, but some bus stops in Bermuda may just be a pole on the road jutting out from the ground. So look for the pole rather than the shade of a typical bus stop. A pole may be pink or blue in color. If the pole is pink, the bus you will get is returning to Hamilton City at the central bus terminal near City Hall. If the pole is blue, the bus is going out of Hamilton to other destinations. The buses have the final destination displayed in front of them so that you know where the bus is going. In order to stop a bus, you need to stand by the pole so that the bus driver can clearly see you. When you board a bus, how do you figure out where to get off? Unfortunately the bus stops do not display the bus timings or route maps, nor there is any display inside the bus indicating which bus stop is coming next. The locals know by heart and they have no problems. But for tourists it can be quite confusing. The best way is to ask the driver to let you know when your destination stop arrives and try to take a seat close to him. Most drivers will be glad to call out the stop so that you can get off. However during busy time and in a crowded bus, he may not always remember. The latest change in Bermuda's bus timetable takes effect from March 18, 2019 after its last change in April 2009. And unlike ferry, the schedule and frequency of bus service remains same in both summer and winter (as of now). This indicates that the bus service is heavily used by the locals and not quite dependent on the tourists. But note that during public holidays and Sundays (and for some routes even on Saturdays), the bus service does get significantly reduced. This route goes via the picturesque south shore beaches along South shore beaches (like Horseshoe bay, Church Bay, Warwick Long Bay, Elbow Beach etc. ), Gibbs Hill Lighthouse and Somerset. One-way average run time between the two ends is 62 minutes. First bus from Hamilton is at 6.20am on weekdays, at 7am on Saturday and 9:30am on Sundays & holidays. The last bus from Hamilton is at 9pm on Monday - Saturday, at 6pm on Sundays & holidays. First bus from Dockyard is at 6:30am on Monday - Friday, at 6:50am on Saturday and at 10am on Sunday. The last bus from Dockyard is at 9:20pm on Monday - Friday, at 9pm on Saturday, and at 5:50pm on Sundays & holidays. There is a bus every 30 minutes. From Dockyard, Somerset takes about 10 minutes to reach, Horseshoe Bay Beach about 35 minutes and Elbow Beach bus stop (in Paget) about 48 minutes. This route takes the Middle road (passing via Waterlot Inn at Southampton) and is great for watching country landscapes & traditional house architecture. One way average run time between two ends is 62 minutes. First bus from Hamilton is at 6:45am Monday - Saturday, and 7:45am on Sunday & holidays. The last bus from Hamilton is at 11:35pm Monday - Friday, 11:30pm on Saturday and 10:45pm on Sunday & holidays. First bus from Dockyard is at 6:15am on Monday - Friday, at 6:35am on Saturday and at 7:35am on Sunday & holidays. The last bus from Dockyard is at 11:35pm on Monday - Saturday, and at 6:35pm on Sunday & holidays. Frequency of service during morning and daytime is every 30 minutes, and the service reduces (every one hours) towards late evening. If you plan to travel from Hamilton to St George or the other way, take bus #10 or 11. They run via the north shore road and take at least 10 minutes lesser than the other routes. From Hamilton, this route goes via Tucker's Point, John Smith's Bay, Crystal Caves, Grotto Bay etc and takes the South Road. Total one-way run time is about 60 minutes. First bus from Hamilton is at 7am on weekdays, at 6:20am on Saturday and 11:00am on Sunday & holidays. The last bus from Hamilton is at 6:15pm on Monday - Saturday, at 5:00pm on Sunday & holidays. First bus from St George is at 7am on weekdays, at 7:30am on Saturday and at 7:30am on Sunday. The last bus from St. George is at 5:30pm on Monday - Saturday, and at 5:00pm on Sunday. Frequency of service during peak office hours is 15 - 30 minutes and 1 hour during off-peak hours. From Hamilton, this route takes the Middle Road and goes via Devils Hole, Crystal Caves, Grotto Bay etc. One-way run time is about 58 minutes. First bus from Hamilton is at 7:15am on weekdays, at 7:45am on Saturday and 9:15am on Sunday & holidays. The last bus from Hamilton is at 5:45pm on Monday to Saturday and at 5:30pm on Sunday. First bus from St George is at 7:15am on Monday - Friday, at 7am on Saturday and at 11:30am on Sunday & holidays. The last bus from St. George is at 6pm on Monday - Saturday, and at 5:30pm on Sunday. Frequency of service during morning and daytime is every 1 hour (from Hamilton the hourly frequency actually starts from 8:15am though on weekdays). Note: 8am service from St. George actually departs from Grotto Bay. This route takes the north road and goes via Aquarium, Perfumery etc. One-way run time is about 50 minutes. First bus from Hamilton is at 7am on Monday - Saturday and 9:15am on Sunday & holidays. The last bus from Hamilton is at 9pm on Monday - Saturday and at 5:15pm on Sunday & holidays. First bus from St George is at 6:15am on weekdays, 7:15am on Saturday and 10:15am on Sunday & holidays. The last bus from St. George is at 10:15pm on Monday - Saturday and at 6:15pm on Sunday & holidays. Frequency of service is mostly every 1 hour. This route takes the north road as well and goes via Blackwatch Pass, Aquarium, Perfumery etc. One-way run time is about 50 minutes. First bus from Hamilton is at 6:30am on Monday - Saturday and 7:45am on Sunday & holidays. The last bus from Hamilton is at 11:30pm on Monday - Saturday and at 10:45pm on Sunday & holidays. First bus from St George is at 6:45am on Monday - Saturday and 7:45am on Sunday & holidays. The last bus from St. George is at 11:45pm on Monday - Saturday, at 10:45 on Sunday & holidays. Frequency of service is every one hour. This is the only bus route which connects St George's Town with St Davids. The route enters St Davids via Southside Road and exits via St Davids Main Road. The total one way run time is 25 minutes. NOTE: The earlier services to Clearwater beach has been discontinued in the new bus time table. So you need to take a taxi from St. George to get to Clearwater beach. The first bus leaves St George at 6:15am on Monday - Friday, at 7:15am on Saturday and at 8:15am on Sunday & holidays. The last bus from St. George is at 8:15pm on Monday to Saturday and at 6:15pm on Sunday & holidays. From St Davids, the first bus leaves at 6:15am on Monday - Friday, at 7:15 on Saturday and at 8:40am on Sunday & holidays. Th last from St. Davids is at 8:40pm on Monday - Saturday and at 6:40pm on Sunday & holidays. There is a bus every one hour both ways. Visit this Government of Bermuda's page where you will find a link to the detailed bus schedule. While the bus service in Bermuda is quite frequent during the normal hours of weekdays, the service gets slower (i.e. time gap between two bus services for a destination increases) towards late evenings, Sundays and public holidays. During the rush hours (i.e. essentially the office hours), the buses get quite crowded. So try to avoid using public buses during such hours. The best time to use buses would be between 9:30am to 3pm, and again after 6pm. Here are some more tips for you to know when the bus service can be easier to avail and more time saving than the ferry service. Sometimes the ferry can be far more effective. Between the dockyard at the west end and Hamilton city, the ferry can be a lot faster than the bus. A direct ferry between Hamilton and dockyard will take about 20 minutes compared to about an hour by a bus. And the ferry service between these two places are also quite frequent. Bus ride from Dockyard to St. George (west end to east end of the island) takes about two hours with a transfer at Hamilton as there is no direct bus. Whereas a direct ferry from dockyard to St. George takes only 35 minutes. However this ferry service is limited and operates only between April to November. If you are in Hamilton City and like to go to St. George at the east, bus is a better option. There is no direct ferry between Hamilton City and St. George. You will need to take a ferry to the dockyard and then a connection to St. George. The whole ferry journey will take more than an hour including the wait time at the dockyard. On the other hand, a bus ride from Hamilton to St George takes just about an hour and the service is more frequent. While public buses in Bermuda are very popular and efficient, there are several reasons why you may need an alternative mini bus or van service, although the rate might be slightly higher. 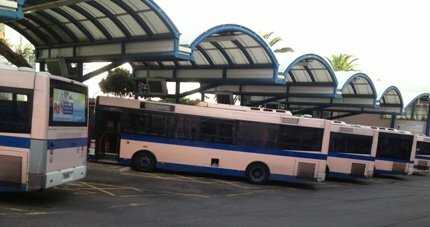 The public bus service won't reach you to every possible place in the island. Or when the buses are crowded (which is often the case in high cruise season), a round trip to the beaches in a minibus could be a great alternative. Also the east-end attractions of St George's and St. David's are better connected by minibus services. Check out Bermuda Minibus & Van Services for all such options. Buses are the best places to meet local Bermudians. When you board a bus in Bermuda, it's a general courtesy to greet the bus driver by wishing him 'Good Morning' or 'Good afternoon'. You will see that Bermudians always do so and even to the fellow passengers. The bus drivers in Bermuda are generally quite friendly. Unless it's a rush hour and the road is full of traffic, a bus driver will usually call out the bus stop if you ask him to do so when you board. Buses stop only on request or when there is someone waiting at the bus stop. To stop a bus, you will need to press a buzzer available in the bus. On your request, the driver will be happy to announce your destination stop on arrival. Eating and drinking are not allowed in a bus. You can not also carry heavy luggage in a bus. For Lost and Found in Bermuda buses, call 441/292-3851. We are staying in a rental house near Maximart in Sandys. We'd like to purchase a pass for buses/ferries, but first need to take the bus to a proper vendor. Are we able to use a $5 bill to board the bus for our first ride to get out to the Dockyard area? Or, are bus tickets/passes sold at the Maximart, by chance? You won't get passes or tickets at Maximart. Bus drivers usually accept $5 bills these days. My wife and I had a great week in Bermuda. Our bus transportation, including the first day from the airport, was a highlight. Not only did it get us around economically, but it was a great way to see the island and its residents. The drivers were extremely helpful throughout. The only problematic transport experience we had was one weeknight when we waited in Devonshire for a #3 bus that never came--though all schedules said there was a 6pm from St. George. It was a mystery. Thanks for your help. If I am going from the Bermuda airport to a West End destination, my understanding is that the fare is $5. But I am seeing a difference of opinion about whether I need to use coins or could pay on the bus with a five dollar bill. Please advise. Thank you. Hi, bus drivers accept $5 bill these days although official mode of payment by cash is coins. Note that airport to west end would require a transfer at Hamilton and you should take a transfer slip from the bus driver so that you do not have to pay for the second time. Good day: I boarded the #8 bus on Front Street (in front of the gas station) at 16:45pm today. I asked the bus driver if he drives to lower road between Warrick beach and the Fairmont, his reply was yes. When we arrived to the Fairmont, I realized I was on the wrong street, and I asked for a transfer to go back. He said the transfer wont work and I will have to pay again. He was very rude. I was with my baby, and didn't argue with him, so I exited the bus. After I left, I realized he lied to me, and he rightfully should've given me a transfer of 15 min, so I can catch the next bus back. Your tourism says all Bermudians are friendly, and readily available to help? This is the 2nd time I have witnessed your bus drivers rude to tourists. Your bus drivers are the worst in customer service. I encourage you to track down this bus driver, and teach him customer service skills. When paying a cash fare on the bus, does it have to be with Bermudian money? Can tickets and tokens be purchased with US$? US currency works everywhere in Bermuda including in Buses and ferries. If you pay cash on the bus, you should tender exact fare in change. Hi Raj, Thank you for all the good information. I am planning to visit Bermuda in a few days. Either in backpack or shoulder bag, we are putting our clothes, some snacks, shoes, snorkeling mask, and items. I heard that bus won't allow large luggage. I was wondering how large or what is size limit of bags in general? Thank you!! Hello, I wonder if you can help me? We are coming to Bermuda in a couple of weeks and my daughter is bringing her blow up paddle board with her to use at the beach. When deflated and packed it is about the size of a large back pack. Is she able to take this on a bus when we go to the beach? If no could you suggest what would be the best way to transport this to the beach? We will be staying near Hamilton. Tanking you in advance. Hi, bus drivers won't usually allow a large backpack on a bus. The best option is to take a taxi (they charge extra for luggage in the boot). Raj, Your site is so helpful. This is the plan. Dock in Bermuda day 1. First caves. Then lunch at swizzle then horseshoe bay. Second day undetermined. Looking for total hassle-free. 1. Good to buy a 2 day unlimited bus pass so we can travel freely? 2. What time is the last bus to dockyard? 3. Are the passes available for purchase at the dockyard? 4. I notice A transfer in busing and it says you must take the next available bus for the transfer to count. Suppose you want to stop for lunch in between? How does that work? Thanks! Hi, with a 2-day pass you can travel freely across the island in public buses and ferries for 2 days. Last bus #7 from Hamilton to dockyard on weekdays and Saturday is at 9:15pm, the last bus #8 from Hamilton is at 10:45pm (but there is no service between 6:15pm and 10:45pm). You can purchase the passes at the Visitors Service Centers at the dockyard. Since you have a pass, there is no need to worry about bus transfers because your bus rides are anyway unlimited. Transfer matters for other modes of payment (tickets, tokens, cash etc)... one needs to collect a transfer slip from the first bus driver and then get into the connecting bus within the stipulated time mentioned in the slip (which is usually 15 minutes)... so a lunch in between wont work. Pat, bus transfers are free. But you should collect the transfer slip from the driver and take the connecting bus within the time mentioned on the slip (usually 15 minutes). Otherwise you need to use a second ticket for the next ride. We have 2 days on Bermuda with the cruise ship coming April 23rd 2017 ! My wife and I were thinking of buying a book of 15 tickets for $37.50. Is the ticket good for a single journey on bus and ferry irrespective of distance? For example we could take the ferry from Dockyard to Horseshoe bay with one ticket? Thanks. You should buy 14-zone (i.e. all zone) ticket booklet and not 3-zone tickets. Then a ticket can be used for any single journey in bus or ferry irrespective of distance. Bus transfers are free and the same ticket would be valid. Can a walker or wheelchair(both fold-up) be brought onto the Bus ? Anything you bring should either sit on your lap or go under the seat. Otherwise it won't usually be allowed in a bus. We heard good things about the bus system in Bermuda but obviously the system has changed. We waited an hour for a bus going to the beaches as well as back we finally gave up on the bus system and paid additional for a cab. Your bus system is horrific you should have more buses when crew ships are in port. The buses really did negatively impact our day at the beach. We were never told there were children prices as well and paid for nine adults when we should've paid for only six. When we tried to get a refund for the three children tickets we were denied. I am telling everyone to take the cab system. Stay away from the buses!! Reading some of the question from your readers, I came across a few areas, when purchasing tickets or passes if using a credit or debit card one does have to show a photo ID, it is goverment policy. And with the distance between the 14zone ride and 3 zone ride, their is a required space of travel which all drivers are taught in training, so they all know. Just thought i inform you of these things thank you . Hi, bus #11 operates till late at night between Hamilton and St. George. There is one leaving St. George at 9:45pm and should be at Grotto Bay Resort in about 20 minutes. You can also ask the resort concierge to arrange a taxi for you. Taxi fares are the same until 12 mid night after which there is a surcharge (25% for smaller ones). Hi, Raj. I thought I saw somewhere about rules for what you are allowed to wear on the buses, but can't find it! We will be going to Horseshoe Bay Beach for the day, then returning to Royal Dockyard after sunset. Can we wear our swimsuits with appropriate cover ups both ways or should we prepare to change clothes before we return on the bus? Thank You!! Hi, proper cover ups is okay in buses (like a top/t-shirt with shorts) and of course shoes. Men should not be shirtless. Hi...I'm considering traveling to Bermuda with a small folding bike to explore the island. I've found info on allowance of Small FOLDING bikes on ferries...but was wondering if they would be allowed on the buses in Bermuda. Thanks. Nope. Buses usually do not allow any obstructive items. 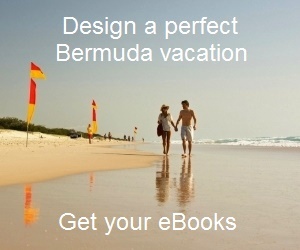 Hello, I will shortly be visiting Bermuda and was thinking of a weekly pus pass to travel. Do I need a photo or passport or any ID please, Regards. No photos or IDs required to buy passes. Hi, Could you please tell me if we can carry a beach umbrella on the bus from Kings Wharf to Horseshoe Bay Beach? Thank you. If it is foldable and unobtrusive, you can. Hi, buses have similar schedules (for most routes) on Sundays and Public Holidays. So go to the Bus Schedule link I have provided, go to a route and look under Sundays & Holidays. From Kings Wharfs will I be able to travel by bus to Hamilton, and see most of Bermuda, if so what is the fee for bus travel? What buses would one take to get an overview of the islands. Does a bus leave from the Wharf? Hi, There are two bus routes from the dockyard to Hamilton - bus #7 and 8. The bus stop is close to Kings Wharf pier (3-4 minutes walk). Take bus #7 goes past Sandys parish (where you will go over the smallest drawbridge in the world called Somerset Bridge and see Ely's Harbor), then by the beautiful south shore beaches on Southampton and Warwick parishes. From Hamilton you should take another bus (#10, or 11) for St George which is the historic town and the former capital of Bermuda. You will see the north shore as you go towards St George. After seeing the attractions in St George, take a ferry back to Dockyard (note the timings of the Orange route ferry ... only few services). You can then get some flavor of Bermuda. Bus fare is $4.50 if you pay exact fare in cash (only change), $4.0 if you buy tokens from Visitors Information Centers at the dockyard. Transfers in buses are free. Tokens can also be used in Ferries. You can alternatively buy a day pass which can be used both in bus and ferry. Hi, Last bus from Hamilton to dockyard is at 10:45pm (route #8) all days of the week. The previous one is at 9:15pm (route #7) all days except Sunday. Average run time 62 minutes. Hi - When we leave St George to take a bus to Hamilton - do we catch the #10 or #11 bus? Or, are they the same - which bus takes us closest to the town? Then, when we leave Hamilton to head back to the Dockyards, is it easier/faster to take the ferry of a bus? Many thanks! Hi, All buses (except bus #6 from St. George) finally terminate at the central bus terminal at Hamilton located near City Hall. From St. George, bus #10 and 11 will reach Hamilton faster compared to #1 an 3. But you can take any of them to reach Hamilton City although they follow different routes. Where does the 6 bus start in St. George, going to Turtle Beach? Is it near where the ferry comes in? Is Turtle Beach on the same stretch of beach as Clearwater? I love Turtle Beach, an escape from the cruise passengers! As a first time visitor to your beautiful island I suggest that you post route numbers and timetables at all your bus shelters. Then visitors can feel confident in using the service. This will also take congestion off the roads as more people that take the bus the better for everyone. Back in the UK, timetables and routes are displayed at all stops and you can also get text messages sent telling you when the next bus is due and if it is going to be late! Best wishes to the bus service! There are no zone marking that one can verify how many zones they have traveled. Most bus drivers really don't know. This is confusing not only to Bermudians, it is EXTREMELY confusing to the visitors. I love the buses, but we used to be able to get them at the airport. That was a huge convenience. Now if we arrive on a weekend there is no place to get the passes. Please make them available for the tourists when they arrive at the airport.